Longtime residents of the Seaport neighborhood have bemoaned that, with all the cranes along our growing skyline, there haven’t been enough features of a real neighborhood. Alas, while we still are waiting on a grocery store, alert your stomachs: a bevy of new dining options is about to open to tantalize your taste buds no matter the occasion. South of the Border Sizzle: The team behind La Casa de Pedro, a popular Latin American restaurant in Watertown, will soon open a second branch in our backyard at 505 Congress Street. Aiming for a summer start, chef/owner Pedro Alarcon will bring big portions with Venezuelan inspiration, live music, and nine variations of the mojito to his 10,000-square-foot Seaport outpost. A Tale of Two Burgers: We couldn’t be more excited for the opening of two popular NYC burger joints that are as far apart on the patty spectrum as one can get. Shake Shack will hold court in the Watermark Seaport at 85 Seaport Boulevard. The company’s fifth Boston-area outpost will bring its crinkle-cut fries, frozen custard, and seasonal Maine lobster-topped Surf ‘N Shake burger to our neck of the woods early next year. Also, keep a look out for By Chloe, an uber-hip vegan burger chain going into the PricewaterhouseCoopers building at 101 Seaport Boulevard. Chef Chloe Coscarelli was the first vegan chef to win Food Network’s Cupcake Wars and brings to Boston a medley of vegan burgers, salads, sandwiches, dairy-free ice cream, cookies, and, you guessed it, cupcakes. 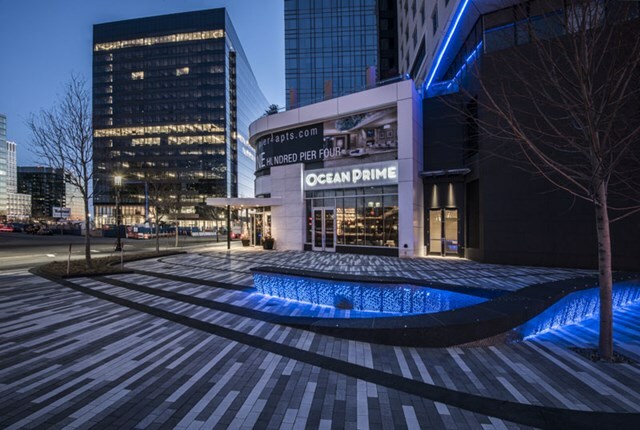 Carnivorous Delight: Meat lovers will find two new entries into the neighborhood’s growing steakhouse establishment currently populated by such Seaport favorites as Ocean Prime. Mastro’s Steakhouse at 22 Liberty is going into a space that was originally rumored to be a resurrected Sam’s at Louis. However, the team behind Sam’s decided to focus on South Boston’s the Maiden, and now visitors to Fan Pier can expect to be showered with signature crab cakes, beef carpaccio, and a variety of cuts of red meat—all with a stunning view of Boston Harbor. For those desiring a more feminine side to their filet, STK Rebel will be the place to be, as they promise to “paint the town pink.” The steakhouse at One Seaport Square will have a live DJ most evenings and also offer a lower price point than its sister brand STK. The Palate at PwC: The new PricewaterhouseCoopers building at 101 Seaport Boulevard is going to be quite the gourmet hub. Along with By Chloe, Aceituna Grill and Yoki Sushi will offer healthy, fresh fare for your growling stomach. Yoki will bring more choices for sushi and Japanese fare in the neighborhood. Aceituna has become a hotspot for Mediterranean fare in Kendall Square with lines routinely out the door for such favorites as chicken shawarma, Greek salads, and hummus. It seems only natural to open a location in this innovation neighborhood as well! Photo courtesy of Ocean Prime.